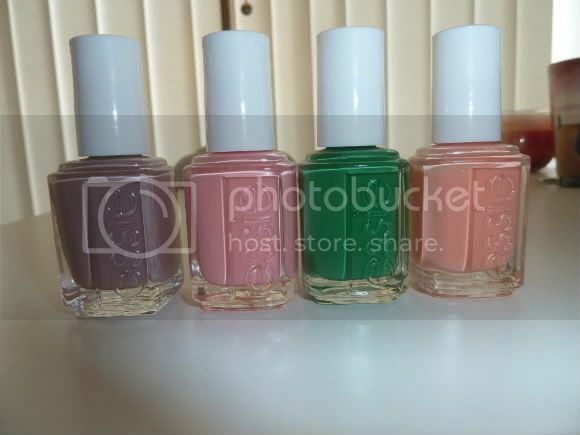 I placed an order from a fantastic eBay seller who sells OPI, Essie, China Glaze, at bargain prices (we're talking £2-4 a bottle and the same for shipping) For the four polishes I bought including shipping it cost just under £20. (Amazing considering Essie is about £10 a bottle in the UK) The order came within less than a week and I can't recommend the seller highly enough. The seller is beautyzone2007 and you can find it here. So here's the line up! I've swatched them all and love them all equally. Demure Vixen is a classic mink with a twist. It has the most gorgeous pink and blue microshimmer running through it which is just gorgeous. Knockout Pink is the ULTIMATE Barbie Pink. Word. It looks different in the bottle compared to how it looks on the nails. Haute as Hello is a lovely coral. Just the right mix of pink and peach. A definite winner. I've got a feeling though that out of all 4 of the polishes this will be the worst to apply. I can imagine it being quite thick with a tendency to go streaky. Ooh very nice, I particularly love the green. love the baby pink one! Ooh gorgeous! Let us know how you get on with them! And thanks SO much for linking to that eBay seller, they have some great stuff! Hi, I haven't bought any Essie since Tart D'eco seriously stained my nails despite using base coat. Did you notice any staining with these colours? I've been doing swatches of these all week on my blog! Today's was Haute as Hello, which is so gorgeous, but the formula is really streaky. Essie sure isn't worth the money they charge, but they do have fantastic colours! I need to check out that Ebay seller to see if I can get some bargains!